Continuing the previous post on Religion without God, a very short book (30,000 words or so) by the late philosopher and legal expert, Ronald Dworkin. The first phrase that caught my attention was on page 7, "In less violent places like America they fight mainly in politics... The fiercest battles are not between different sects of godly religion but between zealous believers and those atheists they regard as immoral heathens ..."
Well, I was taken aback by the offhand phrase, less violent places like America! My response to this one phrase is a post in itself. I wonder how he was measuring violence. But it appears that physically violent crime rates have declined since the 1990's and are about the same as in the 1960's. Equally, despite the highest rate of gun ownership, and that we hear more news of gun crimes in the US, the rate is lower than many other countries. So let's allow this unsubstantiated phrase and consider the impact of the gridlock in congress these last 6 years over health care and other budgetary items like the debt ceiling and protecting the banks from collapse by quantitative easing and so on. These are the fiercest battles, as he calls them. They reveal to me a pent-up violence from the right wing, a wing often associated with conservative, religious, 'godly', values. This battle was not between believer and atheist, but between believer and believer. But then, some who say they believe haven't done much listening. They say "if God cares for the widow and orphan, good then, I don't have to". And they say to the government worker, "Come now, your job is not that important, give it up for 8 weeks and join our fight against this and that." The difficulty over this is that politics in America is not actually about God but all about money and how it should be spent and accumulated. This power is ultimately what the battle is about and it affects both domestic and foreign policy in left and right wing governments. Of all the things that characterize humanity, violence in the defense of self-interest is perhaps the most obvious. It is much more obvious than "ethical independence". Many of us can make use of the controlled violence of constraint through the application of law via the police, but even this is violence, though limited. The nine original principles of western police forces are here. They are remarkably different from and far less violent than what one might expect. Externally, many of us must also depend on the violence that protects American interests abroad. Something is amiss here - and I am complicit, like it or not. I am complicit also in the capital accumulation issue. I profit from the stock market. I am a businessman, a corporate owner, whether directly or by proxy. I am not ethically independent here. I have delegated my portfolio to an expert. Though I hope that my benefits are not on the backs of others, it is possible that my son who struggles with home payments pays banking fees that show up in my dividends. At least he will inherit some day! Where is the place of non-violence? Where is the place of innocence? How can we be innocent of this 'abundant transgression'? (Psalm 19 directly connects the numinous of the created order, the Torah, and our complicity in trouble.) How can we deal with the domestic and foreign fears we are all subject to? Can 'religion' do the job, or can the notion of ethical independence? One has to ask also if God can do the job. Or faith in God, whatever that means. Let me suggest that we live in the sixth day when God said - let the earth bring forth the living creature after its kind. We have not yet entered the seventh day when God rested. (See Psalm 95 and the interpretation in the letter to the Hebrews.) And we are the work in progress that God is creating after God's own image and likeness. So we see what we are to be, and it is not what we are. We are violent and self-protective. We say, you are my refuge, but we take refuge in guns and bank accounts and the social contract that excludes many who are not in our self-image and likeness. Could we do otherwise? There is no immediate positive answer to this question, but it reveals our knowledge of good and evil. There are some negative answers. Our tools: economics and military might, and the coercion that accompanies them cannot provide our ultimate deliverance. They create and magnify the very evil we seek to manage. Abuse begets abuse. Capital for all its benefits lures the unwary into creating scams and bubbles. And killing terrorists begets more terrorists whose interests require a strong motivation to fight against our interests, which, of course, are not theirs. Our latest tools in worldwide communications at least raise our awareness, but by themselves, they are still subject to our will as we get more and more subtle with software. Dworkin wanted to find solutions in all his difficult legal work. But what is the story that will support a solution and that will really gift us with a spirit of power - yes we have real capacity, and love - to see and care for the other, and the self-control that comes from a sound mind? It will not do simply to be 'less violent'. Does morality precede God? Abraham asks YHWH, Shall not the Judge of all the earth do right? This seems to imply that God is subject to a prior good. Religion without God is the title of a very short book (30,000 words or so) by Ronald Dworkin, a philosopher and a substantial legal mind. He didn't use Genesis 18:25 but it would have supported his argument. I suppose though that he knew for whom he was writing and that maybe his first thoughts are for a legal argument and not a Biblical one. It's too bad, because I think if you want the weak-kneed to use your book and you know they read you with distrust and read their own book with fear (something he assumes without support in a number of places), then you should trick them with your knowledge of their book and use their own weapons against them. I was given Dworkin to read by a friend. The thesis of the book is that the atheist has common ground with the theist in the perception of beauty and truth (He is a romantic like John Keats) and that freedom with respect to "ethical independence" should be considered as a suggestion for replacing freedom with respect to "religion" in the UN Declaration of Human Rights (and similar documents). He makes it clear with several examples how the two clauses of the First Amendment of the American constitution are in conflict with each other. The argument of the last section of the book is clearly the work of a legal mind operating within the judicial systems of the Western world. I more or less skimmed this chapter since I think my friend is more interested in my responses to the earlier chapters - which I will come to in another post. But I was very impressed with what I skimmed of the conflicts that freedom of religion has led to. These are conflicts we are familiar with. For example, the Quebec Charter of Values developed before the defeat of the parti québécois, or the Swiss prohibition of minarets in 2009, or conflicts over prayer in public spaces and of course over sexual and reproductive morality. I have avoided writing about many of the religious problems that plague our southern neighbour and ourselves as well - such as evolution vs special creation or something called intelligent design, a name with a serious misuse of adjective. I have also taken for granted the equality of women once I realized that my youthful arguments from ignorant zeal were not going to win any day. The issues of belief and signs of religion in public places have not too much bothered me but they are always on the periphery of things that could be worrisome. It is fair to say that I would not have been happy hiring someone who wore a ceremonial weapon. I do not think weapons are a legitimate means of resolving problems and I know that people can be tempted to anger and impulse. I think Dworkin is approaching Religion without God primarily because of these divisive issues in American culture and religion. But he argues in the first sections of the book as a philosopher against God rather than as a lawyer recognizing the tension in the resolution of constitutional conflict. His appeals to value are important and difficult, but they have nothing to do with proving anything about God from a philosophical, logical, or mathematical point of view. I gave up long ago trying to prove anything about God from the point of view of existence. It is futile. Provably so. There are things that are true that are not provable. And I was surprised to read a very clever mind trying to justify atheism. Equally futile, I think. Atheism is sometimes the only healthy option, but like God it is not provable. (I did not say like theism. God is not a theist.) The last half of the book was enjoyable because it embedded examples from the American and European story. The first half was disappointing because it seemed to completely lack story. My God is story based. The Bible is a record of encounters in a long story over millennia, a kind of Festschrift for God, a series of anecdotes, poems and stories about the perceived presence of the Holy. The Bible may be wrong in our experience about what is implied in the story, but it is not wrong to have included the story. And what it says about presence is what we know from other hints - from the cosmos, from beauty, from music, and so on. It is easy to dethrone the gods that demand obedience to doctrine and patriotism. The God who governs should not be so trifled with. So look for a moment at the story in the Psalms. a sceptre of equity the sceptre of your kingdom. This is quoted in the epistle to the Hebrews 1:8-9 concerning "the son". In Hebrew, it is immediately followed there (Hebrews 1:10-12) by a quote from Psalm 102:25-27. These two psalms were not about the future of a particular king when they were written, but were about love (Psalm 45) after the destruction of the temple (Psalm 44) and about a prayer of the poor (Psalm 102) reflecting the language of the prayer of Moses (Psalm 90) which in turn is a response to the failure of governance in Israel (Psalm 89 culminating the laments of Books 2 and 3 of the Psalter, Psalms 42-89). Psalm 102 promises renewal even in the face of perishing of the heavens and the earth. of the evening it is cut down and dries up. Book 4 encapsulates the rule of YHWH. Religion without God has no such pointer. It is good for the author's legal mind that he was not successful in resolving this particular problem. He closes the book with "a prayer" that theists accept atheists as having "the same grounds for moral and political conviction as they do". Here, he picks his limitations carefully and I think accurately - so also do I pick mine. In another post, I will pick apart some of my particular beefs with the first sections of the book. Here's a good read by Amy-Jill Levine. How well do we listen and how often do we impose shuttered vision onto what we read? I am ready to be able to see again - in 3 weeks left eye - then see double for 2 weeks - then right eye. And today walking strong - beginning my recovery with 2 to 3 km a day walks - increase gradually. Larry Behrendt has suggested to me that I take a new project seriously. I am not qualified to do this thing - but that never stopped me before. He writes "There is a strong need to thoroughly explore the relationship between Jesus' nonviolence and the Jewish attitude towards violence in Jesus' time and place. There is a similar need to integrate the effort to interpret the Gospels to show a nonviolent message, with an effort to read the Old Testament with similar generosity and purpose." What kind of God? God from God, Light from Light, Very God of Very God. The question jumps to mind as I noted at Larry's blog: "there is a good argument for non violence as the core character of God. Note particularly the summary of the character of YHWH in Psalm 146:6-9. The imitation of YHWH - to be complete, holy as YHWH is complete, holy is a worthy calling - exactly the same I think as the call to obedience that is given to those who follow Jesus. One could write an essay on this beginning with Exodus 34:6 as it is elaborated in the Psalms: 25, 86, 103, 111, 112, 116, and 145. " What kind of God? And God said ... let the earth bring forth (Genesis 1:24). This word for kind will be used in the Psalms here - Psalm 17:15. Here we are as beasts emerging from the earth - our creation and our true birth is to be made in God's image - after God's likeness. And there we are in Psalm 17 satisfied to awaken lie God. I would add that this is a God who cares about image. Psalm 73:20. And one whose emerging children walk about almost oblivious of the image they are called to. Psalm 39:7. These two psalms use the same word as image in Genesis 1:26. Likeness is used only once in the Psalms in a verse that no one reads, Psalm 58:5. Well there are some thoughts on a project - how should I discipline the work? Dialectics for kids. HT James Crossley's blog. Check it out. "Paul has given that single Abrahamic family a name: Christos." NT Wright's whole essay is here - worth the read. So also is AKM Adam's series on language, particularly the one I tweeted a bit about today. So let's not think we know automatically what Christ means - let's just be the glass of water, the visitor in sickness, the comfort that is needed wherever we can be present to another as God is present to us. The 9 days of my hospitalization were remarkable for the care shown by the staff and the competency by those who conducted care and the operation I required to keep on going. I am now home. The link will tell you more than you might need to know about the human body. I was moved by the experience but I don't know if I can write about it. Nonetheless, my disabled son asked me if I was in touch with God during the operation and I said yes. Coming out of the anesthetic and being under the influence of morphine is quite psychedelic. But my Hebrew improved during this period and there were remarkable visions. I said something in Latin too but right now I cannot remember it. The Hebrew was all from the psalms - all about refuge and hope. During the entire 9 days I had the Brahms Requiem in my head - these words with their music: Denn alles Fleisch ist wie Gras und alle Herrlichkeit des Menschen wie des Grases Blumen. (Isaiah 40:6). Maturing - is it possible? What constitutes maturing of the human race? I really wonder if I can write this last essay of the series. So much is not about 'me' but about social maturing. Yet so much is wrong, and there are so many setbacks and returns to primal violence whether religious or personal that one despairs of anything in the way of the appearance of completeness in the human condition. The surprise is that maturing is possible but the individual brings it about by what is not, and by what is indirect. The direct process is the obedience to a command. But what command? and what kind of obedience? Yesterday I thought I could express this. Today I find the words elude me. I could come straight to the point: Jesus found the means to the end of completeness through his own self-giving. We can also find this but it is by no means obvious. Paul makes the point directly in his conditional phrase: if you by the Spirit do put to death the deeds of the body, you will live. How does one mortify deeds? And how did Jesus know this would work? He knew through the psalms - not for their violence, but for their recognition of the character of God as compassionate and not violent. (E.g. Psalm 86). Let God arise and let his enemies be scattered - (Psalm 68) - indeed - but how? Is it just another local battle? Just another pile of spoils? Just another pile of bodies? No. The answer comes in the form of Psalm 69 - the waters are up to my neck, do not let me slip in the mud, do not leave me in the pit. The enemies that are destroyed are our own inner enemies. Sounds far-fetched, doesn't it? When the wolf is at the door, you kill the wolf, you do not give yourself to it. Anyway - it is God who matures and he does it in response to faith - whatever that is. 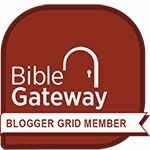 Read Psalms 1, 15, 26, 101, and so on to know the ways in which the human is invited to respond to the character of God. It is not with violence. I will keep writing on this - if possible. It has a lot to do with what others write about in these difficult times. It begins with giving up the dominance, the me-first, and it begins and continues with care for those who are devastated by those of us who refuse the path of self-giving. Here's Psalm 116 - I can't escape from the fact that I think it is in the Psalms that Jesus recognizes what must happen to overcome the sin of the world. Morning, Lord, Morning I will arrange for you. 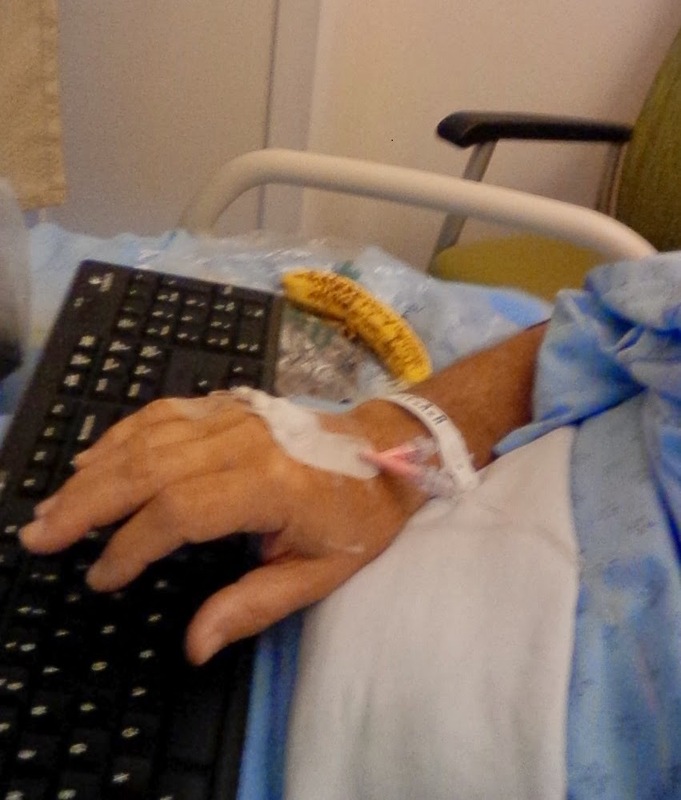 one hand typing - intravenous feed is for hydration. It is 5:00 am. My eyes open in a hospital cubicle. I am attached via catheter to a bag filling with pink liquid. 24 hours ago it was red, the consequences of a distended bladder which for 8 weeks has been giving pain to the normal processes of life. I have slept now for 8 hours. Probably the first uninterrupted sleep in 15 years. But not unaided. A morphine suppository manages the pain and atavan controls the bladder spasms. It is difficult to type in bed - not to mention when tired and drugged. But after more than a year of recovering from cancer treatment, I want to continue the saga of the difficulties that get in the way of recovery. In some ways I had put up with the conflicting pains of rebuilding the lower bowel after radiation (see this post on treatment and my prior posts under the label cancer). For convenience I even brought a wireless mouse. And though I can barely see the screen because of my cataracts, the little red lines tell me when the keyboard has shifted on my lap so I can correct the spelling. There is no WIFI here so I have hooked up my Blackberry as a hotspot. Works beautifully. I even have access to my office computer. So what happened? How did you get here when two nights ago you were watching tennis on TV and playing with an active 9-month-old. What got me was plummeting kidney function. Blood-work over the last 3 months has showed that the kidneys were failing. I think it should have been acted on with greater promptness. Apart from the painful lack of sleep, I had little in the way of symptoms. Eventually a nephrologist saw the ultrasound and phoned me with an order to get to emergency. She recognized the urgency of the situation. Medical communications were not well managed until this last minute. I was blaming the increased difficulty of having to wake up every 2 hours or less on the original radiation treatment. My inferences should have been corrected. That's a long story. When one is ignorant, one does not want to listen to someone else's explanation of the 'facts'. Time to pay attention and perhaps insist that others who are qualified should act as well as measure and coordinate. And here I am. The triggering problem may have been inflammation in the prostate. We shall see. For now, a certain stability has been reached. Or so I hope. Blessings to all - learn to listen to your body - and may the medical protocols work for you. Well, I did not succeed in presenting my third petal without a bunch of Biblical terms. That's because I wanted to couch the expression in historical categories - like those intuited by the human animal as words were invented for them: so perfection, completeness, holiness, purity - why am I not pure? holy? complete? or perfect? For I am definitely not. Note I do not concur with the phrase 'total depravity' or the like. I make no appeal to 'original sin' - rather I would suggest original responsibility and a true but limited depravity that is a result of misunderstanding what is good. It cannot be 'total' or there is no appeal to responsibility. God cannot be unknown or the human bootstrap program will fail. Now to the fourth petal. Discerning the other. Do I dare listen to those who are different from me, even those who in some measure might be seen as beyond the pale? I am not sufficient unto myself. I exist only in community. Nothing that I am is knowable except as it is related to others. This includes my language, my culture, my biases and my beliefs. Even the relationships that I am found in are only known in relationship to other groups that I am not in. There is no escaping relations. Nothing that I can say can be said without the contextual assumptions that are within my culture. Yet if I stick only with such parochial views, I am still stuck in a failure to see that which is truly other than me, my group, my cultural assumptions and so on. Not, mind you, that I accept or condone some other aspects of the other, whether within my own group or outside of it. Nonetheless, I am connected, whether I am in or whether I am out. Even my being out is defined by relationship. I am also connections. I am an assembly of microbes, all of which are essential to my life: there are 100 trillion bacterial cells living on and within our bodies, 10 times the number of human cells that comprise ‘us’. How can I think of myself as if I were an individual? Can you imagine yourself as so dependent on microbes? A full-blown ecosystem, run by domesticated bacteria called mitochondria? Why then should we love our neighbour as ourselves? Why should we love our enemy and do good to those who hate us? Who is this neighbour who along with us is ruining the very space we are together inhabiting? Who is this enemy who stands against all we hold dear? All that we value? On the micro level, if our own members war within us, we get sick and die? On the macro scale, we labour to eliminate our enemies and control our environment for our own sakes. Do I blame / do I relate to an industrial catastrophe? Like the pesticide spill in Bophal, India? It is not hard to imagine my inadvertent complicity in the industry that supports my own desire for a pest-free garden? But having learned of such things, do I approve - e.g. more recently, of the awful working conditions in sweat shops for clothing around the world? I visited such a sweat shop in the 1970s in Toronto! I could see right away that there was no trust between worker and management - only dependency and exploitation. The problems were not far away and I was in the middle of them. In those days, the exploited were refugees from Czechoslovakia. What about kleptocrats and Russian gangsters today? I do not approve of course, but I question whether economic factors alone can fix such a situation as we find in Ukraine today. They will change it, but not fix it. How does a bad relationship get fixed? And of course this one is beyond my immediate power or influence. The 2014 Church of God [its international headquarters in Anderson, Indiana, USA] Convention held at The Church of God Mission Compound, Lalmanirhat, Bangladesh, was a rich experience for the organizers and the participants alike. The convention was inaugurated by The Honorable District Deputy Commissioner Muhammad Habibur Rahman. A Muslim by birth and practice, the District Deputy Commissioner keeps a solemn relationship with the Church of God Missions in Bangladesh. The festival was convened from 24 to 26 April 2014. There were about 700 delegates (including children), mostly from sixty-eight rural Bangladeshi churches, gathered during this great event. The meetings were blessed by the presence of youths and office staff from Dhaka (Senpara), Lalmanirhat, Kaunia, and Kakina. The general theme of the conference was “Let Your Light Shine!” based on Matthew 5:16. This conference focused on "Love Your God, Love Your Church, Love to Give, and Love Your Family". There are several groups in this example, circles within circles, places to learn love. Love, of course, the ultimate connector, cannot be used to promote disaster. Ultimately it will call greed to account, even if it takes a lot of time. and between anyone and the other among you. You may begin with family, but must not neglect responsibility for right judgment with anyone including the foreigner (guest, sojourner) which I have rendered 'the other'. The white fire is as critical as the black fire. We never learned this easily. I recall the bullies I sensed when I was 50 years younger. Avoidance was my technique, not resolution. And the abuser? There was no escape for a child. And I might add, there was no good advice either and a lot of poor training in strength. The word 'sinner' was not applied to the ones who held the reins of power. One could multiply examples, but it is not for our own understanding or abstraction. What is first of all important is how we act or not with the situations we find ourselves in. How do we learn to respond in love to what may be hateful to us, to inferred motivations, that we might learn to see responsibility in others, and our interconnectedness? With David, however, I will not allow myself to take responsibility for actions that are not my doing. See Psalm 7:5-6. But I will admit my fault when it is required. Consider Psalm 6. Why does consideration of 'the other' ultimately lead me back to responsibility for the brokenness of relationship that I see in the world? I am clearly not coming up with a simple answer to my questions. Perhaps the fifth and final in this series, maturing, will help. Perhaps the clue will be both in a corporate and an individual maturing, a coming to the fullness of humanity that we are called to. Jonathan Homrighausen at Linguae Antiquitatum has posted the latest carnival here.